Mark Rubin, orthodox Jew and wealthy Baltimore furrier, insists that he had a perfectly happy marriage, despite the fact that his wife and three children vanished. The police won’t help, so he comes to Tess. I blew through most of this series this fall. I’m not planning on reviewing most of them, though; I just don’t feel like I have much to say about them. They were all enjoyable, but mostly quickly forgotten. And since I read five of them back to back, they kind of blend together in my mind. Really, this one is no exception. I have but one rant, and it’s really more of an editing rant than a beef with the actual story, but it won’t leave me alone, so here I am. Note: I read the hardcover, so maybe (hopefully!) this was fixed in later editions already. Yes, I’m probably more attuned to it than some, since I live in that vast wasteland known as the Midwest. But there’s no excuse for screwing up (so badly) on geography. Look at a map! Most of Texas lies between the Rocky Mountains and the Mississippi River. I understand that Tess lives in Baltimore and hasn’t ever ventured far from there and is probably clueless about this, as so many people who live on the coasts are. But this paragraph wasn’t really in her words. It should have been accurate. Anyway, like I said, I’ve generally enjoyed this series. I like how rooted they are in their place, and Tess and her family are delightfully flawed. I think my favorite aspect of this book is how her partly Jewish, partly not, background tugs on Tess in various scenarios. Laura Lippman grew up in Baltimore and returned there in 1989 to work as a journalist. She has won numerous awards for her work. I interviewed her last year. Her most recently published is The Most Dangerous Thing. A classified ad selling a wedding dress (“Never worn.”) is what sparks Minneapolis TV reporter Riley Spartz in this second Riley Spartz mystery. Upper-crust Madeline Post’s fiance disappeared after the rehearsal dinner, but did he run away or is he the victim of a crime? The plot thickens when Riley realizes just how much of an external mismatch Madeline and her former groom-to-be, Mark Lefevre, are. I don’t usually try to solve the whodunit myself; I’m generally content being carried along by the story. But in both of these first two Riley Spartz books, I’ve had it figured out way early (again, without trying). Riley tries to be more careful about putting herself in deadly situations this time out (she borrows a guard dog for a few days, for instance) — but her care only extends to her singular, stubborn interpretation of the clues. At least this time she does realize that she’s dealing with desperate people and she *should* be cautious at several points in the narrative. She’s also willfully ignorant of most technology, which baffles me. Riley does have some traits that redeem her, at least somewhat. For one: She fights for the place of quality, (more) in-depth journalism in a broadcast environment bent on money and feel-good stories. Still, it’s hard to say if she fights for investigative journalism because it’s better or because it benefits her. For two, well, I have to give her some grace since she’s still struggling with her past, although I think she’s growing some (albeit mostly in the background) in this installment. Maybe part of my ambivalence is more precisely directed at how she has so fully bought in to television news. This book definitely has some humor, and when I look back on my reading experience, that’s my favorite part. 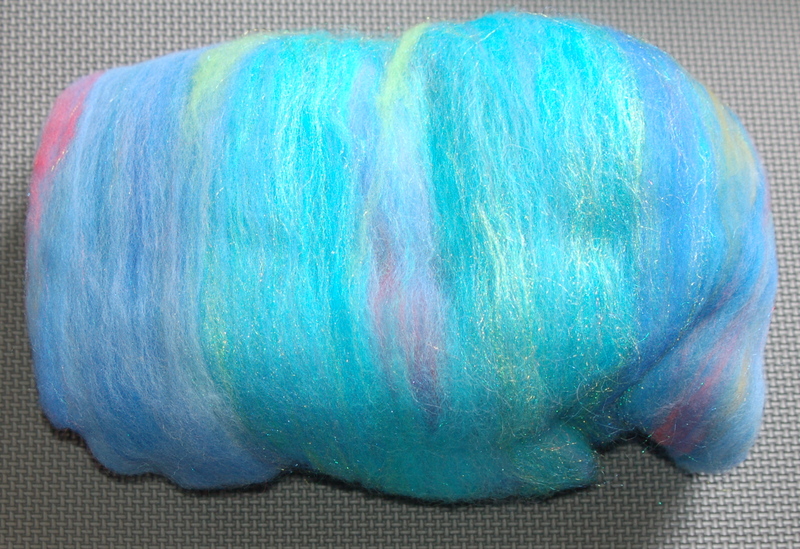 Batt with sparklies — I bought these two batts on two different days, from two different vendors, but they're remarkably similar. I think they're destined to be plyed together, oui? 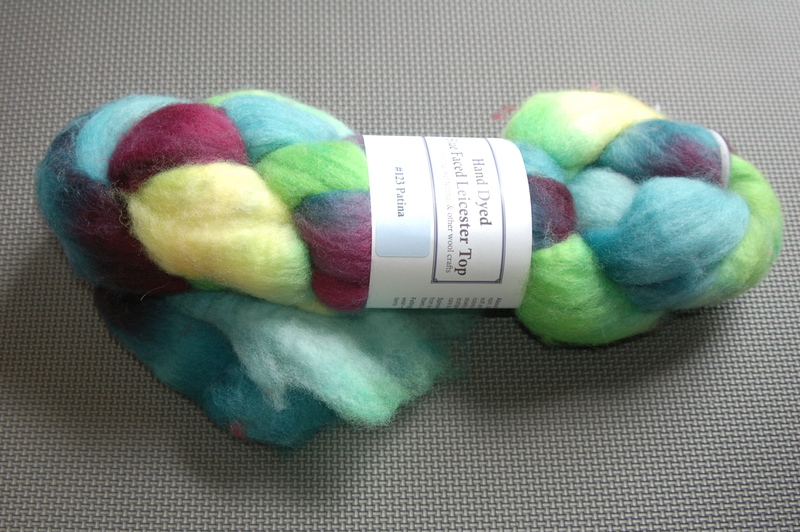 I bought this because Polwarth is a fiber I've been wanting to try. 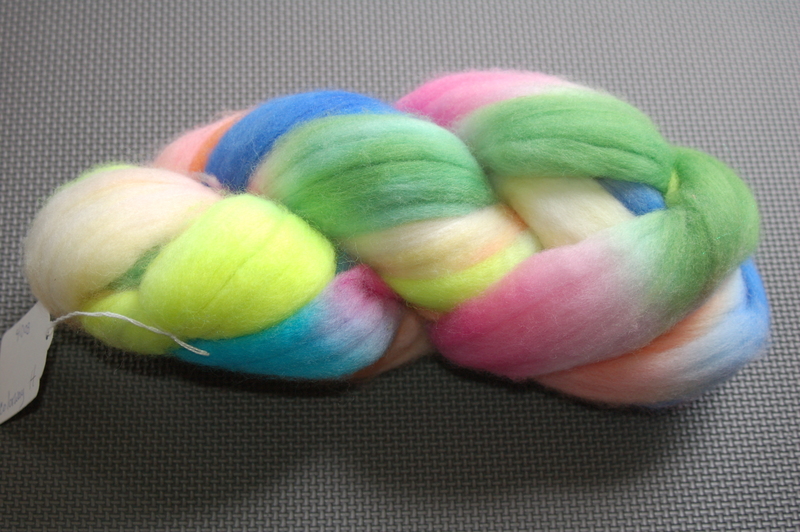 I'm spinning BFL for the first time now, and I'm loving it. 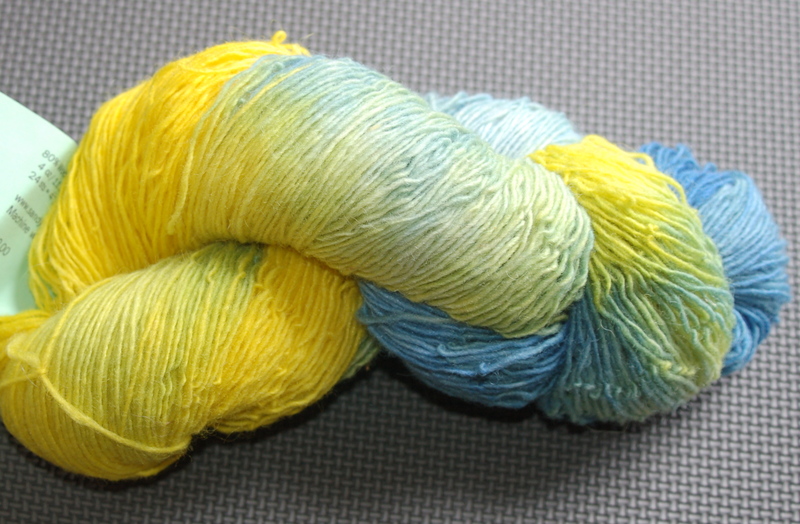 When I saw this colorway, in BFL, I was in love. I floated the idea to Mom that she attend with me, but at first I thought it wouldn’t work. She lives a couple states further away, and it’s turning out to be a crazy summer. Right up until the day before, it wasn’t definite whether we were going or not. But we were both getting excited, and I’m thrilled to say it worked out. We drove over Saturday morning and went straight to the fairgrounds, where the event is held. We looked around, walked through the hall of breeds, the fleece show and silent auction and the vendor area. A few things grabbed me, but the sun and mugginess left me spent in a few hours, so we headed out to find our hotel and food. Sunday morning we were up early, and after traversing mostly empty streets in a downpouring thunderstorm, we took a fiber dyeing class. I was thankful for the cooler air while we stood over steaming wool! After our class, we hit the vendors again and then headed home. See what leaped into my hands? 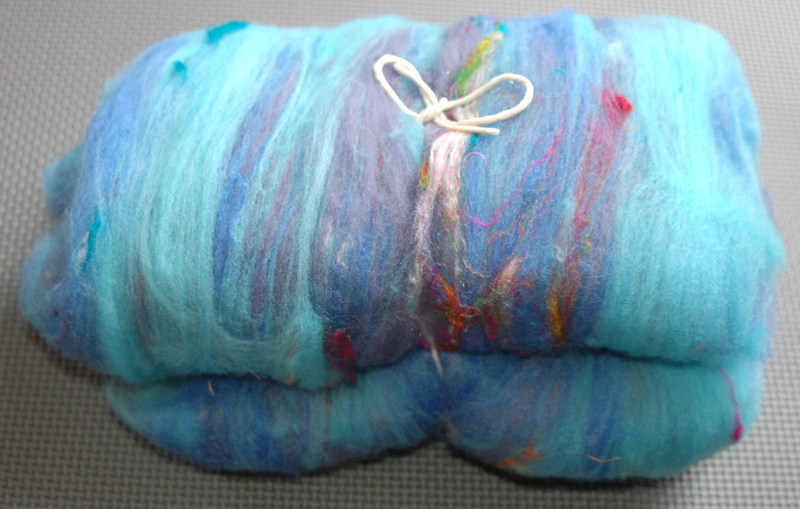 The fiber we dyed isn’t dry yet, so I’ll have to show you that another day. The blue here isn't as intense as I'd like, but hey. Side note: This is the only yarn I came home with. Reuben Land was dead for 10 minutes, 10 minutes that ended when his dad commanded him, in the name of the living God, to breathe. Reuben’s living proof there’s such a thing as miracles. From there, Enger introduces us to 1960s small town Minnesota and the rest of the Land family. Most of my thoughts on this book are expressed in the roundtable discussion, but by way of introduction I thought I’d share a couple things. At the beginning, Peace Like a River reminded me of Tobias Wolff’s In the Garden of the North American Martyrs — the manliness of hunting, violence, etc. (Not that Martyrs is only shallow masculinity. I’m not saying that.) It didn’t take long, though, before this book revealed itself as so much more than rural boys and guns. I’ve consistently seen this book placed in the company of Image Journal list books. Now, having read it, I certainly see why. It’s a great book, I highly recommend it. And now a small part of the discussion, which is spread out over the blogs of all the participants, divided topically. Amy: I have to admit there were times I found the narrative a bit slow for my taste. But I really enjoyed the characters in this book and especially the relationship between Reuben and Swede. What were your overall impressions and feelings of the book? Jen: I thought it was OK, but it certainly didn’t grab me, and took me about three times longer to read that most books of a comparable length do these days. Hannah: I also found it a bit slow-going, but I don’t always mind that. Amy, I agree: Great characters and really fun relationships to observe. Pete: Enger is exactly my kind of writer: slow, deceptively simply, and poetic. He reminds me a lot of Flannery O’Conner or Harper Lee. I didn’t want the book to end. I think I drew out reading it for a couple of months to cherish and appreciate it. Books like this only number a few in a decade and I’m a better writer for having read it. Words like “errant beeves” and “clandestine jellies” are now filed away in my catalog of hilarious and awesome word pairings and Swede, Rueben, and Sonny Sundown will stay with me forever. Caite: And I for one was not disappointed. I must say, I totally loved this book, which may be a minority opinion among our little group. I will agree with one of those quote bit of praise, this one from Pub. Weekly, that it is “one that sneaks up on you like a whisper.” Pete, I think you have nailed it on the head. Very early in the book, I though, “wow, this so reminds me of Flannery O’Connor.” It is, like her stories, about a world filled with grace and miracles, if only we would see them. Loved it. Jade Fitzgerald firmly believes in leaving the past in the past and instead living in the present. (Does it have any bearing that she runs an up-and-coming vintage store?) But her wedding date is nearing, and that envelope addressed to her hippy mother taunts her. She’s tempted to simply not invite Beryl, but her indecision is keeping her from mailing any of the invitations, and waiting even one more day is simply unacceptable to her mother-in-law-to-be. As it has a tendency to do, the past refuses to stay buried in The Sweet By and By and instead must be addressed to allow the characters to move forward. The Sweet By and By greatly exceeded my expectations. This is not just a happy, standard Christian Fiction novel. It is happy and it is Christian Fiction, but it’s far more than that stereotype. The characters deal with real pain, real hurt, and the consequences of their past actions. I loved the Iowa (and Southern) settings. The book had a couple surprises, which I also loved. The further into this book I read, the more I loved it. While it’s not a stupendous, earth-shattering read, this book does gently nudge its characters (and its readers) in the direction of truth. A very quick read; the story pulled me in immediately. I have no complaints about this book — I really enjoyed reading this one. I definitely want to read more of Hauck’s books (this was the first one I’ve read). Sara Evans is a country music recording artist. Rachel Hauck has a journalism degree. She’s the author of quite a few books, including Sweet Caroline and Love Starts with Elle. Follow her on Twitter: @RachelHauck. I received this book from the author, Rachel Hauck.